Buy our quality commercial table cloths. White, ivory and black, round and rectangle. Variety of sizes available. Please note: We do not hire these as the cleaning costs would make the prices too high for our clients. We therefore only supply as new and suggest you wash yourself and re-sell on a well known internet auction site!!! 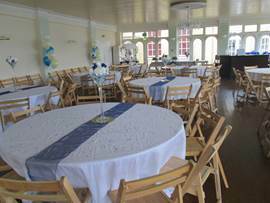 Take a look at our Chair covers and table runners to complete your look. To purchase please email or phone using the "Contact Us" link.